Aquamarine ranges in a brilliant array of ocean hues, which is why it is our favorite stone. Derived from the Latin "aqua marinus" meaning "water of the sea," Aquamarine is said to increase clarity in communication, and tranquility. In ancient Greek mythology, Aquamarine was used as a talisman gifted from mermaids to protect sailors during stormy seas. Today, most Aquamarine is mined in Brazil. Tahitian Pearls are iridescent natural salt water pearls cultivated throughout the waters of French Polynesia. They have gorgeous depth of color and an incredible luster. The oysters that produce these highly sought after pearls were almost over-fished to extinction in the 1700's and are now cultivated using skilled Japanese methods. Ancient Polynesians believed that pearls were the first lights in the world and that their form and brightness inspired Tane, the Polynesian God of Harmony and Beauty, to create the stars. The light sister of Labradorite, Moonstone is a Feldspar stone that at first appears white or grey and then flashes bright rainbow or blue. Moonstone is revered in many cultures for its lunar connection and according to Hindu mythology, it is made of solidified moonbeams. The most powerful time to wear Moonstone, also known as the "Psychic Stone," is during the full moon. Moonstone is mainly found in Sri Lanka, India, and Madagascar. Our stone with a Western vibe - Turquoise is famous for its brilliant opaque blue/green color. Known for its protective powers, Turquoise is one of the oldest stones used historically as a talisman by warriors, shamans, and kings. For this reason, Turquoise appeared in Ancient Egyptian burial ceremonies to guard the passage of the dead. Much of our Turquoise is mined in the U.S., but it is also found in Mexico, Iran, Chile, China, and Tibet. Rock Crystal is one of the most common minerals on earth. When polished, Rock Crystal transforms into a modern looking glass. Rock Crystal is known for its high vibrational qualities and has always been regarded as a source of light and energy. Ancient cultures believed that clear Rock Crystal stones were incarnations of the Divine. Rock Crystal can be found almost everywhere, even in your backyard. More commonly used as a building material, Roman Travertine is reminiscent of perfectly tumbled white and tan beach stones. Originally mined in Tivoli, Rome, Roman Travertine is a form of limestone deposited by mineral springs. Notable architectural wonders throughout history have used Roman Travertine as a primary material including Paris' Sacré-Coeur, the Colosseum, the Getty House in LA, and many major works by Mies van der Rohe. Our Roman Travertine is found in Rome of course! Also known as "Larvikite", Norwegian Moonstone is part of the Feldspar family. It resembles Labradorite in color, but has a more opaque quality with dark black and grey spots. Norwegian Moonstone is said to maintain vitality and youthfulness. It is also a stone of inner vision and past reflection. Norwegian Moonstone is named after the town Larvik in Norway where the largest quarry can be found. Another one of our favorite ocean stones, Kyanite's name is derived from the Greek word "kyanos" meaning deep blue. Kyanite can be found in ivory white, grey, and green tones as well. Kyanite promotes communication and reparation of damaged relationships both physical and spiritual. Some suggest placingKyanite under your pillow in order to interpret your dreams more clearly. Kyanite can be found in Brazil, India, Kenya, and Zimbabwe. We use freshwater Baroque Pearls instead of round pearls because of their gorgeous variation in organic shapes and sizes. As symbols of purity, love, and union, Pearls have been used in wedding ceremonies dating back to the ancient Hindu story of Krishna, who plucked the first Pearl from the ocean and gave it to his daughter Pandaia on her wedding day. Freshwater Baroque Pearls are produced in Japan, the United States, and China. A sibling in the Agate family, Black Agate is formed by tiny layers of interlocking quartz. 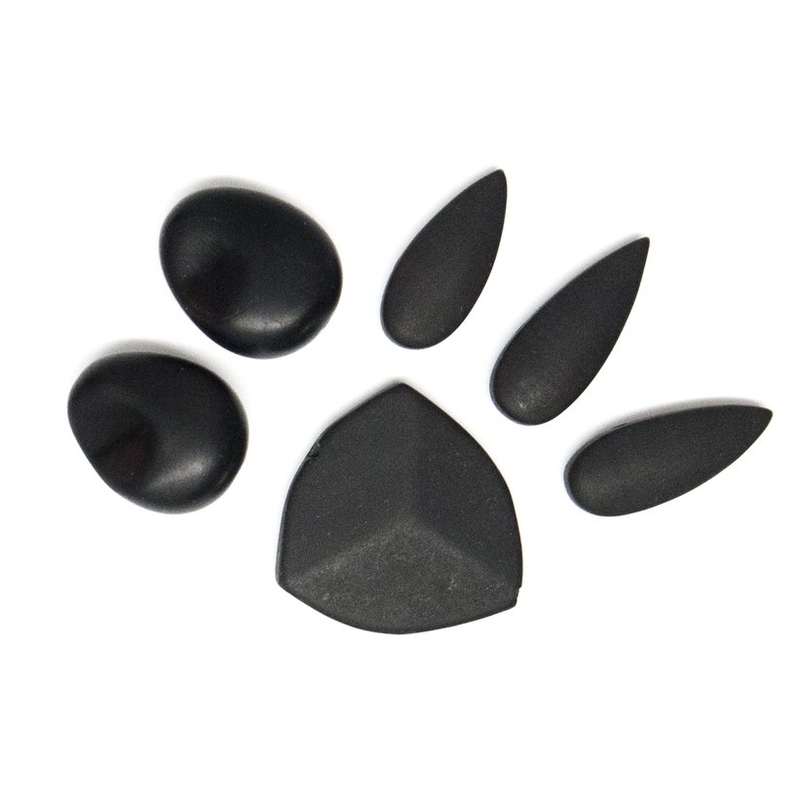 We mostly use matte Black Agate which has a great modern look. Black Agate is known for attracting good fortune as well as for cultivating strength and resilience when faced with difficulty. Agate is one of the most common stones and is found all over the world. Rutilated Quartz is a delicate combination of Crystal Quartz and Rutile (a titanium mineral). Known as "Venus' Hair Stone" for the golden threads of Rutile running through it, Rutilated Quartz aids with focus and self-reliance. Rutilated Quartz can be found in Madagascar, South Africa, India, Brazil, Sri Lanka, and Switzerland. Tourmaline is the most colorful of all our stones which runs the gamut from maroon, to yellow, green to blue and black. Pink tourmaline is said to promote love and understanding when faced with fear. According to Egyptian legend, Tourmaline formed as the result of a journey from the center of the earth through a rainbow. Tourmaline is found in Brazil, India, Bolivia, Tanzania, and Sri Lanka. Derived from the Greek word "opalus" meaning "changing color," opal comes in electric shades of blue, orange, and white with fiery flashes. It's one of nature's most incredible kaleidoscopes. Some opals are 50-65 million years old and date back to the Cretaceous period of the dinosaurs. Most of our opal comes from Australia. Opals are also known as the "Eye Stone," bringing the wearer creative inspiration. Belonging to the Feldspar family of stones (which make up about sixty percent of the earth's crust) Labradorite is an incredible stone with florescent luminescence. At first look, Labradorite is a deep grey but once light hits certain veins in the stone it shines bright blue. Like Rutilated Quartz, Tourmalated Quartz is made up of two materials: clear Crystal Quartz and threads of Black Tourmaline. Clear Quartz is said to amplify the grounding qualities of Black Tourmaline and the two minerals work in harmony to both clarify and deflect negative energy. Tourmalated Quartz is a great neutral and can be quite light with hints of black or a deep grey. Tourmalated Quartz is mined primarily in Brazil. Citrine introduces our earth tones with warm yellow and smokey olive shades. The stone is said to hold the pure sunlight dispelling negative energy. In ancient Chinese myth, Citrine is known as the "Merchant's Stone" believed to bring good fortune and prosperity to those in business. The majority of Citrine is mined in Brazil alongside Amethyst. Jasper is part of the Chalcedony family and, like Agate, has many colors, patterns, and forms. We use Red Jasper (a rusty stone with black or white veins) and a variation we like to call Picasso Jasper as its coloring is reminiscent of Pablo Picasso's cubist palette. In Native American culture, Jasper is traditionally used for rain making. Also known as the "Supreme Nurturer", Jasper is a grounding stone which promotes stability and awareness. Jasper is mined in the U.S. out West in Wyoming, Montana, and Utah.